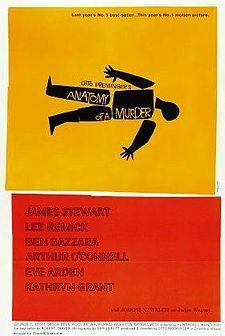 Anatomy of a Murder (1959) is an American trial court drama film directed by Otto Preminger and written by Wendell Mayes based on the best-selling novel of the same name written by Michigan Supreme Court Justice John D. Voelker under the pen name Robert Traver. Traver based the novel on a 1952 murder case in which he was the defense attorney. The picture stars James Stewart, George C. Scott, Lee Remick, Ben Gazzara, Arthur O'Connell, Eve Arden, Kathryn Grant, Brooks West (Arden's real-life husband), Orson Bean, and Murray Hamilton.